Act 46, the new state law which provides for mergers of school districts into larger districts, protects forever all school districts’ present systems whether the district tuitions its students or operates its own school, or a combination of both. The State Board of Education has interpreted Act 46 to mean just the opposite. It has stated: “There is no authority in Act 46 that authorizes a newly formed district/preferred model, to both operate and pay tuition, for the same grade level.” The board is wrong. Not only does Act 46 allow school districts to retain their present systems, the act prohibits the board from disapproving a merger plan because each member district keeps its present system of educating its children. Every lawyer knows the word “shall” is mandatory. The act did not provide any leeway for the State Board of Education. Indeed, the drafters of the act wanted to make sure their requirements were clear, because they reinforced the act’s mandates by stating: “Nothing in this act shall be construed to restrict or repeal, or to authorize, encourage, or contemplate the restriction or repeal of, the ability of a school district …” to continue to operate its present organizational structure. Therefore, when the districts merge, the old member districts have an absolute right to keep their present governance, and the new mega district cannot change, by majority vote, the member districts’ present system of educating their children. The State Board of Education’s advisory appears to be based on a legal analysis of Act 46 by Legislative Council. That analysis is seriously flawed and would not meet even the basic standard of a first year law school brief. The State Board of Education’s advisory appears to be based on a legal analysis of Act 46 by Legislative Council. That analysis is seriously flawed and would not meet even the basic standard of a first year law school brief. It should not be the basis for a wholesale change in our 150-year-old system of educating Vermont’s children. School districts are being advised by the State Board of Education that they cannot operate schools and pay tuition for the same grade level. The practical effect, which is already happening, is that the smaller districts presently enjoying choice are being advised that they must give up their historic right to educate their students as they see fit, and to conform to the educational structure of the larger, more powerful districts. The fact is, they should be advised that if they currently have school choice, they shall be able to retain school choice. Act 46 blocked this kind of power grab. Westford and Elmore, currently going through the process with larger communities and expected to vote in November, are being misinformed. They should be able to take advantage of the financial benefits of their respective mergers, but also to retain their school choice option. Voting yes on the ballot with the wording that is in place now will throw away school choice that they are entitled to have. It is recognized that two groups of hard-working citizens followed a process and came up with ballot items. However, there is too much misinformation from the State Board for voters to make an informed vote without knowing all options, including retaining choice. The State Board of Education is attempting to rewrite the law to force these small districts to give up their historic rights. It has no authority to do so under the law. 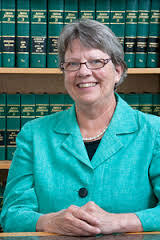 — Deb Bucknam is an attorney based in St. Johnsbury. She also serves on the board of directors of the Thaddeus Stephens School. She lives in Walden. “First year law school brief be damned.” Basic literacy is at play here. The English is clear and requires no semiliterate specialist to stir its entrails or to reveal the incompetence of the Board. Choice is preserved. Simple, the Dems don’t like a law as written, they just interpret it to suite their fancy. Sad truth is that no one ever hold them accountable and they continue to do as they darned well please.